For the Alouette III from the GRTux hangar, see Aérospatiale Alouette III. 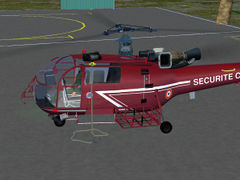 The Aérospatiale Alouette III (French for Skylark) is a single-engine, light utility helicopter developed by Sud Aviation and later manufactured by Aérospatiale of France. The Alouette III is the successor to the Alouette II, being larger and having more seating. The helicopter has a long operational history in the air forces or navies of many different countries. The Alouette-III is equipped with in-sim checklists and tooltips for ease of use - to start the engines, follow the checklist. 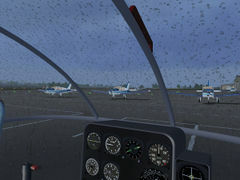 Most controls are implemented via clickspots in the 3d cockpit, only difficult to reach controls have key bindings. 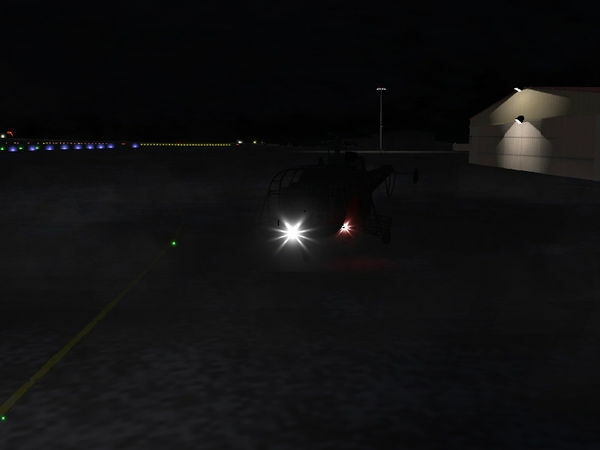 The helicopter comes with a simple autopilot which can hold altitude and heading or follow the heading bug. The AP is designed to help you fly the helicopter, not to fly it for you - it expects a well-trimmed craft, do not engage the AP during dynamical maneuvers. To engage the AP, make sure you're flying straight and level and use the pedals to null drift. First flick the AP master switch Ctrl+a - this makes the AP take over pedal controls. Next engage heading-hold mode Ctrl+h and be prepared to deal with transient altitude changes. 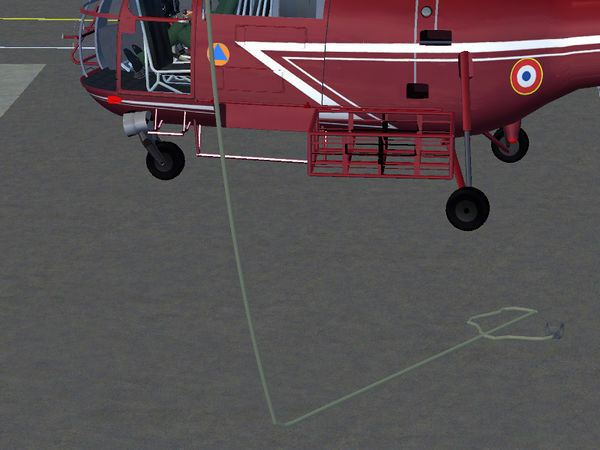 Then trim the helicopter well in the pitch axis such that you can let go of the controls for at least 10 seconds without loss of control. Once that is the case, engage altitude hold mode to lock current altitude Ctrl+l . 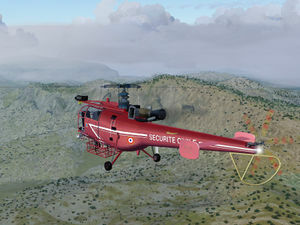 Once the Alouette is in stable flight, you can control it via the heading bug on the heading indicator by engaging the heading bug acquire mode Ctrl+b . You have very limited control over airspeed using the collective. Do not change trim while the AP is on, and do not move your controls around, or you will have to fight nasty transients when you disengage the AP again. 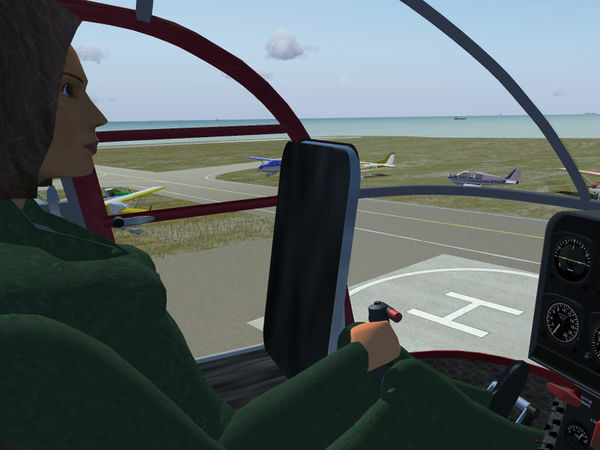 The helicopter has the option to select a working co-pilot as assistant or flight instructor - Amelia (inspired by aviation pioneer Amelia Earhart). If she is selected as crew option, she can be asked to take over controls for hover flight. As she is simulating a human pilot rather than an AP, she is not dependent on working instruments to do this but will fly by sight. She is (intentionally) not perfect in achieving a static hover state immediately. When asked to take off or take over controls Ctrl+t , she'll attempt to stabilize the helicopter in static hover and from then on follow instructions to hover into a certain direction or change altitude given via her GUI menu. She is a fairly capable pilot able to stabilize even a moderately bad situation, but don't expect miracles. While Amelia is flying, there should be no control input given (otherwise the result will be a fight for control). When Amelia takes over, she will always say 'I'm taking controls' and visibly reach for the stick, when she lets go of controls she will lean back and say 'Your controls.' Taking over from Amelia is generally easier if one asks her to hover higher and faster forward before asking for the controls. Amelia will not work if not selected as crew, nor will she take over during cruise flight (you can use the AP for that purpose). 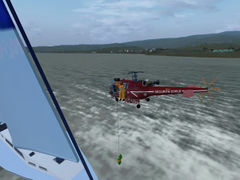 Auto rotation uses the residual energy stored in the angular momentum of the rotor to land the helicopter in case of a turbine failure. You can cause an engine failure in the air by switching the fuel pump off. Move collective into full (down) position. Stabilize airspeed using pitch at 40 kt. The helicopter will drop, the potential energy released helps to drive the rotor to about 200 rpm. Close to the ground, pull up to control sinkrate, then quickly use collective for a soft touchdown. This puts the winch operator in place as soon as the winch is deployed. When close to the emergency site, deploy the winch (overhead panel switch or Ctrl+w), then the winch rope can be extended and pulled in by w and ⇧ Shift+w. There's a model of a man hanging from the rope, he'll vanish as soon as the winch rope is hauled fully in. 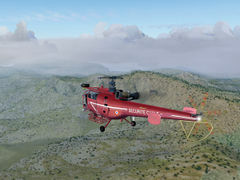 There is a dynamical rope implementation selectable for the Alouette-III which may not be realistic equipment, but serves to exemplify the concept of a realistically simulated rope in Flightgaer. The simulation of the rope solves a simplified set of equations of motion for each rope segment, thus the rope will dangle and deform realistically when subject to wind forces, coil when lowered onto the ground, uncoil when dragged over the ground, gradually adjust direction with the helicopter hover direction of motion when dragged further, change dangle dynamics when under load or lowered/raised via the winch and many details more. The math of the rope is contained as a class in ropeanimation.nas, how to use the rope animation is explained in a README file. This page was last modified on 8 February 2018, at 07:17.